Is SunPower Destined for Greatness? 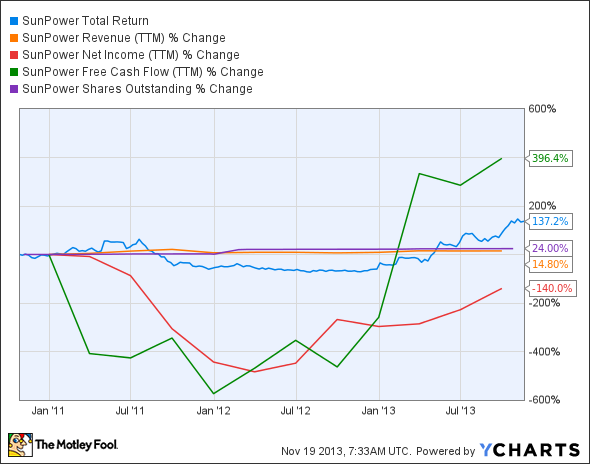 Solar manufacturer SunPower has been one of 2013's best stocks, but is its impressive growth backed by good fundamentals? Investors love stocks that consistently beat the Street without getting ahead of their fundamentals and risking a meltdown. The best stocks offer sustainable market-beating gains, with robust and improving financial metrics that support strong price growth. Does SunPower (NASDAQ:SPWR) fit the bill? Let's look at what its recent results tell us about its potential for future gains. Despite a huge share-price surge, SunPower looks weaker in its second assessment than it did in its first -- the solar panel manufacturer has lost one of the two passing grades it earned last year. Despite a recent rebound in a number of metrics, SunPower's fundamentals continue to languish below levels reached three years ago, when its shares were much cheaper. However, investors appear to be banking on a long-term growth trajectory, and the company may yet meet its promise. 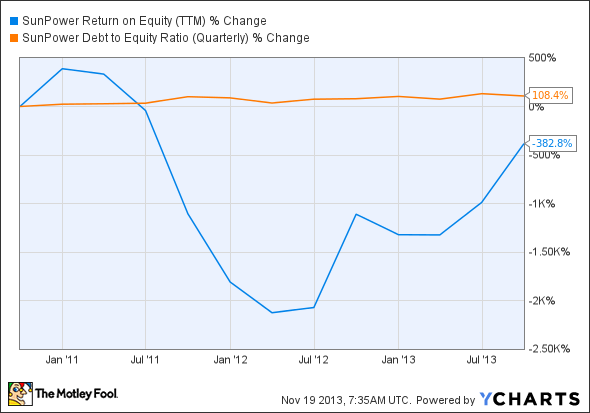 Is the company's share-price rebound sustainable, or will SunPower find that it's lights out in 2014? Let's dig deeper to see what the future may hold. Solar power, which accounted only about 67 gigawatts of the world's energy use in 2011, has seen its use grow by nearly 50% every year over the past five years, double the growth rate of wind power. Fool contributor Jay Yao notes that sector leaders SunPower and SolarCity (NASDAQ:SCTY.DL) possess competitive advantages in distributed power systems, which could wind up being the more powerful long-term trend instead of utility-driven growth, which has been a primary driver thus far. In an effort to meet growing customer demand, SunPower has undertaken a 350 megawatt capacity expansion plan, which will increase its overall capacity from 1.1 GW to roughly 1.8 GW by the end of 2016. Fool contributor Matthew DiLallo notes that U.S. institutions are increasingly turning toward solar power to cut down their utility costs. SunPower recently completed the installation of 20 megawatts at several California community colleges, which is expected to produce cost savings of more than $5 million per year. SunPower is also growing through utility installations, and provided 579 megawatts of panel generation for MidAmerican Energy Company's Solar Star plant project. Utility solar specialist First Solar (NASDAQ:FSLR) remains the category leader here, however, and has installed 550 megawatts at theTopaz Solar Farm, 550 megawatts at the Desert Sunlight Solar Farm, and 230 megawatts at the Antelope Valley Solar Ranch. Solar manufacturers will also benefit from the booming Japanese solar market, which is expected to install 10 gigawatts of capacity this year alone. Foolish solar expert Travis Hoium notes that SunPower has been capitalizing on higher-margin solar panels: SunPower's E20-series panels gained placement at an 86 megawatt solar plant project in South Africa, which is largely managed by Total, SunPower's largest backer. SolarCity recently unveiled its first solar securities (bonds), which will rely on the energy produced by solar systems to provide new financing options for SunPower and its peers to fund residential and commercial solar projects in the next few years. SunPower and Solar City already enjoy access to cheap capital from big backers such as Goldman Sachs and Total, and this is a critical advantage in the capital-intensive panel manufacturing sector. With these factors in its favor, SunPower should be able to improve its score next year and show the market that its fundamentals tomorrow can readily justify today's optimism. Today, SunPower has few of the qualities that make up a great stock, but no stock is truly perfect. Digging deeper can help you uncover the answers you need to make a great buy -- or to stay away from a stock that's going nowhere.